Observing the strong growth of usage of Light Emitting Diodes for lighting purposes of every kind, tinkering with LEDs has become a well-loved topic to me. So, after the little bulb of my bike’s taillight has died, it was obvious not to simply buy a new one, rather to upgrade the good old “Busch & Müller Toplight” to LED technology. First, I want to explain the “phenomenon” of dying taillight bulbs. A dynamo is considered to be a current source. Now, if the headlight bulb dies, or its connection to the circuit is interrupted (like it was in my case, a loose connection), the load of the current source is being increased because head- and taillight are connected parallely to the dynamo. After Ohm’s law, this causes an increase of the supply voltage. The taillight bulb can’t get along with this higher voltage long time…and dies. Same thing the other way round, but headlight bulbs are usually more resistant against higher supply voltages. My dynamo -a FER 2002- provides 3 W at 6 V (like the most ones on the market). The headlight consumes 2.4 W, so the taillight may consume 0.6 W.
After some research in the www, using four ultrabright LEDs seemed to be enough for my purposes, moreover I don’t want to dazzle other road users. Fortunately I had four pieces of ultrabright white LEDs at home. Now just take a look at the schematic. Note: It’s just a proposal from me, it’s cheap, quickly built and works. If you have other ideas or improvements, please let me know! The bridge rectifier simply makes DC voltage out of the AC voltage provided by the dynamo. R1 is the required series resistor for D1 and D2 (I think showing the calculation is not necessary at this point). With D5, D6 and D7 I’m scaling down the voltage for the other two LEDs, so a smaller series resistor is required. Why so pedestrian? Because I wanted to prepare my light for equipping it with a goldcap capacitor, so D3 and D4 should shine while standing at traffic lights for example. A goldcap has a maximum voltage of 5.5 V (first reason for the diodes). And with a higher series resistor there would be a higher power dissipation at this point – and I want to use the small budget of power stored in the capacitor as effectively as possible (second reason). Unfortunately, I didn’t have such a capacitor at hand, so I left it out for now. According to my calculations, a 0.47 F capacitor should light up the two LEDs for about 20 seconds. Last but not least, I wanted to build in an overvoltage protection. First idea was simply to use a Zener diode, but I kept in mind that in the case of a fault, a current of 400 mA would rush through the diode. Using a 6.2 V Zener diode, there would be a power loss of 2.48 W. Normal Zener diodes can handle power up to 0.5 W, so I looked for some high power Zener diodes. The 5 W ones were pretty expensive and not available, so I just took two pieces with 2 W and built them in parallel. You have to cut off the black plastic holding for the bulb, until the two pieces of the Toplight fit again and you can reassemble it. Don’t forget to attach wires from your board to the connection terminals of the light! Now you can install your new dynamo powered LED taillight on your bike! I strongly recommend the usage of red LEDs instead of white ones. In my case the white ones are too bright, even for the red plastic, and so it’s more a purple taillight than a red one. So use red ones, and you will have a red taillight. Why use such an outdated thing like a dynamo? There are cheap and good battery powered bike lights on the market! Well, a dynamo never runs out of power, is more reliable and you can’t forget it at home! 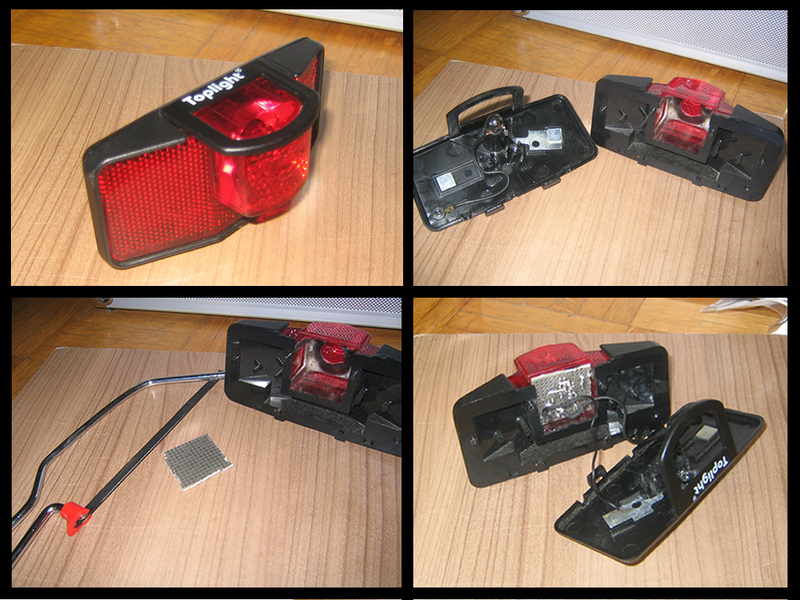 So I hope you enjoy the building and the use of this simple but cheap taillight! Sure, there are many more good plans for LED lights in the www (see LED Treiber), but hey..SIMPLE…CHEAP! If my headlight (a B&M Lumotec Halogen) dies one day, I will turn it into an LED light also, be sure to find an blog post about it here. The usage of self-built lights in road traffic are not allowed in every country. Use at own risk!